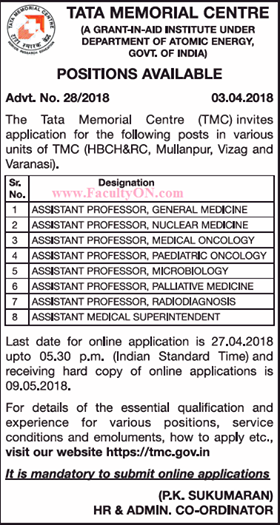 Tata Memorial Centre, HBCH&RC, Mullanpur, Vizag and Varanasi has advertised in THE TIMES OF INDIA newspaper for the recruitment of Assistant Professor jobs vacancies. Interested and eligible job aspirants are requested to apply with in 27th April 2018. Check out further more details below. About College: The Tata Memorial Centre (TMC) is a Comprehensive Cancer Centre with a mission to achieve the highest standards in patient care, cancer prevention, cancer research and professional development for oncology and allied disciplines. TMC is an autonomous body funded, controlled by the Department of Atomic Energy, Government of India. TMC is affiliated to Homi Bhabha National Institute (HBNI). The HBNI is a Deemed University of the Department of Atomic Energy with a mission to develop high quality postgraduate educational programs in science and technology including those related to life and health sciences.